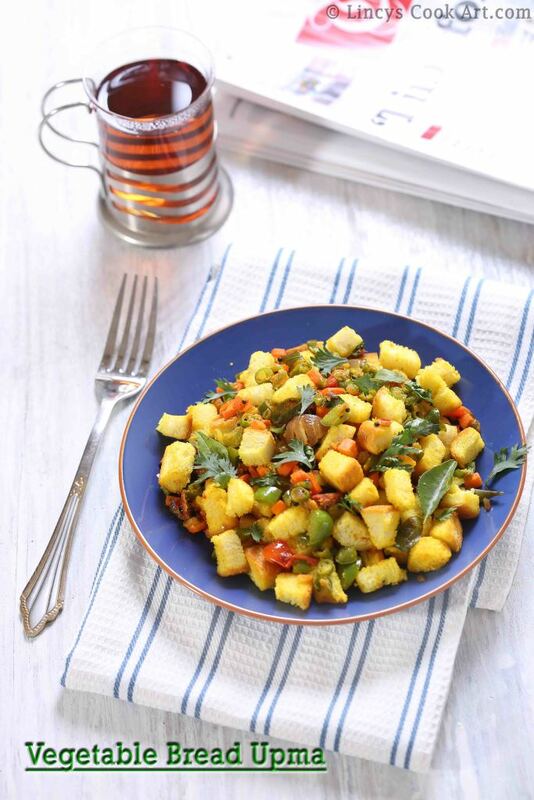 Bread Upma| Bread Stirfry is an easy and quick to make breakfast or snack made with any white or brown leftover bread. This is quick to make and an easy way to finish off the leftover bread in a tasty way. This time I had some bread slices that were about to expire so I decided to make this upma. My kid loved this upma. Even me started loving this spongy soft bread upma. You could make this recipe with a few bread pieces and consume as a snack. You can prepare this upma simply with onion, ginger and green chillies like normal upma. I have added some veggies to make it colourful and also healthy. Chop the onion, ginger, green chillies, carrot, beans and capsicum. Align the bread one over the other and cut them crisscross 4-5 times to get small sized bread pieces like croutons. Heat oil in a pan and splutter the mustard seeds, jeera and curry leaves. Once they crackle add the onion, ginger and green chillies. Once the onion turn translucent add the finely chopped tomato and vegetables with some salt. Cook the vegetables in the oil if required sprinkle little water to cook the veggies. Once the vegetables get cooked add the turmeric powder and cook for thirty seconds to relieve the raw flavour. Now add the bread pieces and mix well; cook for a minute or two till the bread pieces gets the heat, becomes soft and the colour of the bread changes. Sprinkle some chopped coriander leaves and switch off the gas. Notes:Use vegetables of your choice to make this upma. You could use cauliflower, sweetcorn, potatoes, cabbage, broccoli too. Add red chilli powder if you like to prepare the dish more spicy. Sprinkle little water if required if the mixture is about to burn. Do not pour water and cook like normal upma.